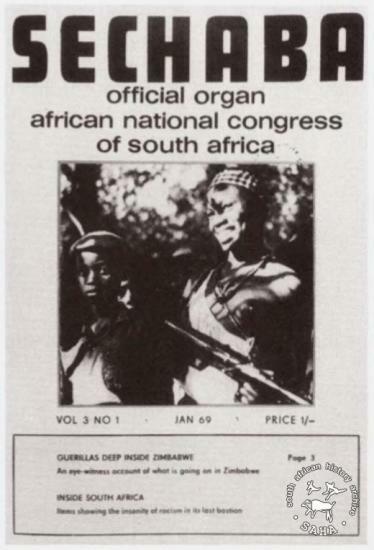 Description: This is a cover of the January 1969 issue of the journal Sechaba: official organ of the African National Congress, volume 3, number 1 with a photograph reflecting the situation in Zimbabwe at the time. 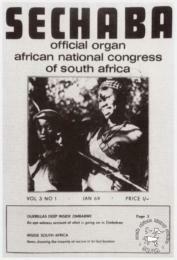 The cover is reproduced in black and white on page 100 of Julie Frederikse's book 'The Unbreakable Thread: non-racialism in South Africa' originally published by Ravan Press in 1990. Included in SAHA's online edition of the book and in the virtual exhibition 'Tracing the unbreakable thread: non-racialism in South Africa'.